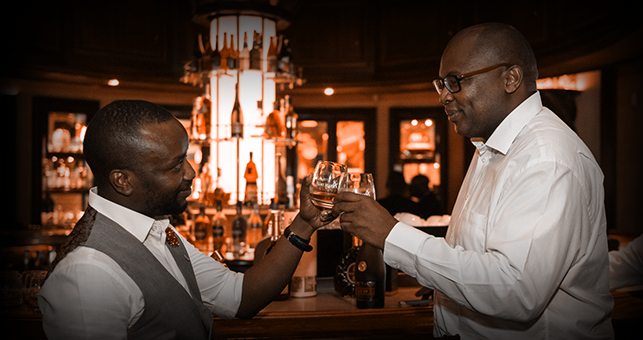 Premium cognac brand, Rémy Martin, has featured two inspiring South Africans in their latest advertising campaign, which launches this week. The campaign, entitled “One Life. Live Them.” has entered its third year, continuing the call for individuals to explore a life that is rich with experience. “The call “One Life. Live Them.” encourages people to live their lives to the fullest,” explains Phil Voget, Rémy Martin Marketing Manager. “We want to inspire people to explore their many talents and diverse interests, instead of simply being defined by just one thing that they do. Over the past two years of the campaign, we have featured local individuals who have inspired us by living extraordinary lives. This year, we continue with this, and feature two gentlemen who are truly more than just the name on their business cards, who truly embody the concept of being defined not just by one thing, but by many”. The 2017 campaign features two local faces – Sivu Madikana and Madoda Khuzwayo – who were picked by the brand because of the range of experiences they have, and the accomplishments they have achieved. The campaign features each individual, describing them by their “slashes” – the passions that drive them and which make them unique. Sivuyile Madikana is a lover of fashion, a trailblazer, a humanitarian and a mentor. At only 30 years old, he is something of a phenomenon and intellectual renaissance man. As well as a qualified medical practitioner, he is somewhat of a social media super-star and fashion trendsetter. Last year he was featured as one of GQ’s Best Dressed Men of the year. He is also a leading voice in social-activism and uses digital media as a means of promoting health consciousness. He considers himself a lifelong learner, made the Mail & Guardian’s 200 Top Young Influential South Africans list and is currently undertaking his second Masters Degree in Public Health at New York University. “There is absolutely no substitute for hard work. In the process of working hard, work smart, enjoy the journey that is life. When you look back, know that you lived life to the fullest and you did it ALL,” he explains. Madoda Khuzwayo joins Rémy Martin as a face of the One Life. Live Them campaign for the second year in a row. He is an inventor, businessman, educator and technologist, as well as an avid traveller and foodie. Growing up in KZN, he moved to Gauteng and studied engineering, but found that his passions lay in online and mobile technologies. He has subsequently founded a number of companies, one being HOSTRIVER, an accredited ISP that provides web presence solutions to businesses across Africa. He is now a serial technology entrepreneur working across London and South Africa. He also has a passion for food, which, along with his travel experiences, led to him developing a food and recipe portal dedicated to publishing unique recipes from around the world, provided by professional chefs and brands. The campaign was developed by local advertising agency Saatchi & Saatchi Brandsrock.